By Danielle Stephens | October 5, 2013. Dublin councillor blames ‘media blackout’ for little interest in the directly elected mayor campaign, reports Danielle Stephens. 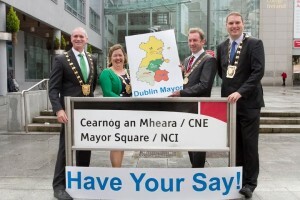 The public response to the new mayor4dublin website, which lets Dubliners have their say on a proposal made for a directly elected mayor, has been minimal, according to two councillors running the campaign. The site is part of the public consultation period of a plan requested by the Minister for Environment, Heritage and Local Government Phil Hogan. It is intended that Dubliners will be able to vote on the issue of a directly elected mayor at the same time as the local and European elections. So far, however, there has been little feedback from the public on the issue. Cllr Carrie Smyth, who is the Cathaoirleach of Dun Laoghaire, is worried about the level of disengagement shown by the public. She blames the media for a lack of coverage during the process. According to the Labour councillor, the mayors from the four councils met at this year’s Skyfest to promote the initiative and to pose for pictures with each other. However, she still hasn’t seen any pictures from the event featured in any media source, local or national. With the referendum now over the Mayor for South Dublin, Dermot Looney, is hoping that the focus will switch to the debate surrounding a directly elected mayor. He said that the process has been rushed from the beginning and that the councillors are constrained by time limits, in order to get the plan ready for next May’s elections. Cllr Oisín Quinn is more positive about statistics he gathered from the website earlier this month. As of 25 September, results after nine days show that nearly eighty per cent of those who have filled out the survey have said they are in favour of a directly elected mayor. Figures will be released after the closing date for the public consultation, on the 12 October. A directly elected mayor would replace the need for four separate ones and would be in office for five years in comparison to the current year long term. Under the proposal the mayor would also be handed more executive powers. The purpose of the website is to give the residents of Dublin the opportunity to voice their opinions on the idea by filling out an in depth survey. After only four months in office, the four mayors are enjoying their role in their communities. Cllr Smyth is pushing for the refurbishment and upgrade of areas in local communities that would benefit Dun Laoghaire’s residents. Her mandate includes the renovation of the Dun Laoghaire Baths and Shanganagh Castle and the creation of a new sports hub in Marlay Park. Cllr Quinn, the Lord Mayor, was influenced into the world of politics by his uncle Ruairí Quinn, leader of the Labour Party in the 1990’s. He is enjoying his time in the Mansion House because it is rare that he is met with hostility by others. Although the job can be demanding, having to bring people together to push an issue forward, a lot of his time goes to acknowledging the good deeds of the people of Dublin. Cllr Looney has focused his time in office primarily on groups that deal with young people, the elderly and the environment. At the end of September, the South Dublin Mayor and the Deputy Mayor took a pay cut to establish a fund of €10,000. Groups involved in the areas previously mentioned can take small grants from this fund if needed. Cllr Kieran Dennison is the only Fine Gael representative of the four and is heavily involved in plans for the environment. As chairman of the council’s Environment Committee, he is hoping to have a regional wastewater treatment plant built to provide a “sustainable and reliable drainage and wastewater treatment for the [Greater Dublin Area]”. By mid-October, the four councillors will know the fallout of the public consultation process. From there, they will move forward with a plan for a directly elected mayor for next year’s elections.